Marriott La Sella Golf Resort in Denia provides a luxury hotel experience for the most discerning guests. The Hotel is located alongside the Montgó National Park, only 10 minutes from the beaches of Denia and Javea, and only 30 metres from the first hole at the La Sella Golf course, with 27 holes designed by José María Olazabal. Marriott La Sella Golf Resort has a range of accommodation from deluxe rooms to suites with views over the golf course and the stunning Montgó National Park. There's a choice of restaurants and bars, including the acclaimed Segaria which offers fine wines and Spanish cuisine. The spa provides treatments ranging from facials and body wraps to physiotherapy, while there is also a state-of-the-art fitness centre. Guests can take part in activities including horseback riding, flamenco dancing, wine tasting and regattas. The cosmopolitan town of Dénia has more than 20km of coastline and is well known for hosting many festivals including the famous Bull Run through the streets and the annual tomato festival! Listed Package Prices: Listed Golf Package prices apply with FREE Buggies and Meal Deal for Offer dates. 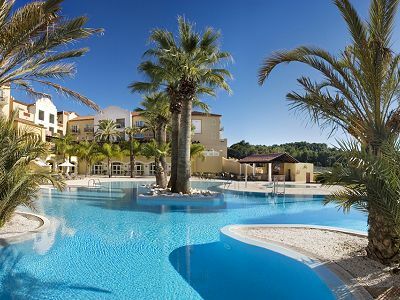 Groups of 8+ receive Free Hotel & Golf for the Group Leader at Denia La Sella Golf Resort & Spa. Listed Package Prices: Listed Golf Packages prices apply with Group Leader FREE. Book a 28 Night Long Stay at Denia La Sella, Alicante for 2019/20 Season. All guest rooms at the Denia Marriot La Sella hotel have in-room safe, 3 telephones, satellite & pay TV, mini-bar, desk with chair, 24-hour room service, luxurious bathrooms, hair dryer, bathrobes, iron/ironing board and balcony or terrace. Deluxe Rooms Mountain View: The rooms with views of the mountains offer a spacious area of more than 30m² and also provide magnificent views over the Montgó National Park. Junior Suites (60m²): These exclusive rooms provide a private lounge, a bedroom with a double bed and a full bathroom. Premium Suites: The fully-equipped Premium Suites are warm and welcoming with cutting-edge design. They feature a spacious lounge/dining room and terrace as well as a hydromassage bath. Brasserie Montgó: Mediterranean. An informal restaurant serving regional and national dishes with a beautiful outside terrace. Open for breakfast, lunch and dinner. Dress code: Casual. Segaria Restaurant: Mediterranean. A celebration of the finest Spanish cuisine in an elegant atmosphere featuring an outstanding wine list. Open for lunch and dinner (closed Sundays and Mondays). Dress code: Formal. Pool Bar: Sandwiches. Mix your favourite drink, a refreshing dip in the pool, and some fantastic scenery. Open for lunch. Lobby Bar: Sandwiches. Serving international drinks, coffee & snacks from 9am every day. Open for lunch and dinner. Jazz & Blues Bar: Open for private functions or special events. Spa/Fitness The Denia Marriott’s spa offers hydrotherapy, massages and Jacuzzi. Treatments include facials, body wraps and physiotherapy administered by professional beauticians, physiotherapists and stylists with one to five-day programmes available. Fitness lovers can make use of the state-of-the-art Technogym Fitness to get into top shape while on holiday on the Costa Blanca. For golfers, the La Sella Golf Course designed by Jose Maria Olazabal is conveniently located at the Denia Marriott Resort. Denia is the capital of the Marina Alta region, north of the province of Alicante. In the centre of the town is the imposing historic Arabic Castle, with all commercial life located on the Marques de Campo (main street). Denia has more than 20km of coastline with golden sand beaches to the north and rocky shores with caves to the south. History lovers can visit the Archaeological, Ethnologic and Toy museums, while lovers of fine cuisine will enjoy the Michelin rated El Poblet. Tourist sights in the city include The Iglesia de la Asuncion church, which has one of the finest domes in the area, and Denia Castle, which is surrounded at its base by quaint colourful houses and offers a beautiful view of Denia Bay. There is a daily ferry service from Denia to Ibiza (you can see Ibiza on a clear day) and there are also full and half day mini cruises to other resorts such as Javea, Calpe and Altea. Spain’s biggest theme park Terra Mitica is just a 40 minute drive along the coast. The marina at Denia provides for fishing trips, mini-cruises and sailing, while the area is well known for its excellent diving and snorkelling. There are many festivals in Denia, most famously the Bull Run and annual tomato festival. The Resort has the 27-hole golf course La Sella Golf (27 holes), designed by José María Olazábal is located within a 2-minute walk from the hotel reception at Marriott Denia La Sella. LLEBEIG This part of the course, surrounded by huge amounts of pines, is characterised by a scenic beauty with spectacular views of the Montgó Natural Park. Technically difficult, it is a very varied round where the player will have to use almost all the golf clubs. GREGAL Located on a flatter terrain, this part of the course has more areas of water and an ending part of the round designed to be decisive for the score. MESTRAL There are new par-three holes (3, 4, and 5) located in a higher area and with a view of the sea, the Segaria mountain and the Montgó Natural Park. This round, which has wider fairways and broad greens, is designed to enjoy golf in the heart of nature. Designed and built by Seve Ballesteros, the Oliva Nova Golf Club course winds gently through lush terrain on the Mediterranean coast. Fifteen holes include water obstacles, with only numbers 2, 13 and 14 water-free. This is a technical course over gently undulating ground. The “amen corner” of the course is at the 13th, 14th and 15th holes, where strategy and the wind are determining factors. The course record of 63 is held by Ryder Cup star Miguel Angel Jimenez! "This course offers great possibilities to all golfers, as it has short, medium and long holes, and fairways with left and right doglegs. I think it poses a challenge to any golfer." – Seve Ballesteros. Levante golf course is an American style course in a characteristic Nicklaus design with broad fairways and exquisitely moulded greens. At 6,612 meters it is a tough but fair challenge and there are memorable views of the Mediterranean and the Finestrat mountain range. Facilities include a clubhouse with cafeteria, Pro Shop, golf store, changing rooms, guest services, driving ranges, and a Golf Academy. El Saler golf course is ranked within the Top 100 courses in the world and within the Top 10 in mainland Europe. Built in 1968 by the internationally recognized "architect of Spanish golf," Javier Arana, the course is located at the El Saler Nature Reserve, on the shores of the Mediterranean. El Saler Golf club also offers a golf school; driving range; putting greens; 2 approach greens; a pro-shop; rental of clubs, hand carts and electric golf carts; and a restaurant and snack bar. 30% discount on listed sharing rates (incl. breakfast).